The Winter Queen is the third in the series of iconic blends from Fusion Whisky and Adelphi, created in honour of the Scottish princess, Elizabeth Stuart. A blend of Scotch malt whisky from Longmorn and Glenrothes distilleries and malt whisky from Zuidam Distillery in the Netherlands, only 866 bottles of the iconic whisky were produced. Elizabeth Stuart was born in Falkland Palace in Fife in 1596, the eldest daughter of King James VI of Scotland and Queen Anne of Denmark. After a brief reign as Queen of Bohemia, Elizabeth spent most of her life in The Hague. In the face of war and exile, her shrewd diplomacy, tenacity and humour saw her political and cultural influence extend across Europe. 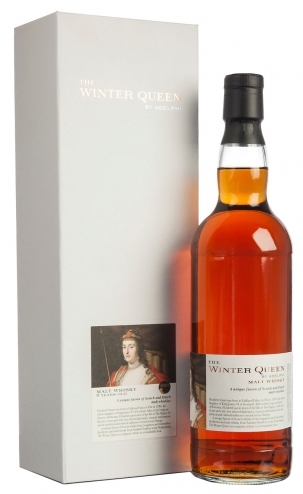 A unique fusion of Scotch whisky from Longmorn and Glenrothes distilleries and malt whiskies from Zuidam Distillery in the Netherlands, The Winter Queen is a majestic tribute to a remarkable Scot. Elizabeth Stuart’s long, extraordinary life began in Falkland Palace on Scotland’s east coast in 1596 when she was born to King James VI of Scotland and Anna of Denmark. 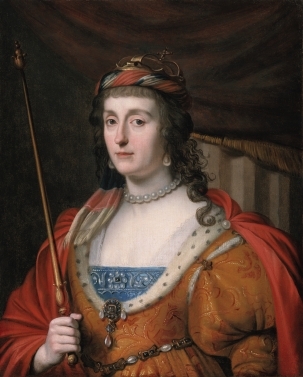 By her death in 1662, she had been heir to the crowns of England, Scotland and Ireland, survived murderous plots and bloody sieges, borne 13 children, been crowned Queen of Bohemia, and revolutionised cultural life in the Dutch Republic, her adopted home of forty years. Elizabeth was embroiled in power struggles from a young age. In 1605, two years after her father was crowned King James I of England, she was targeted in the notorious Gunpowder Plot. The conspirators had intended to assassinate her father and install nine-year-old Elizabeth as a puppet queen. But Guy Fawkes was caught and the plot thwarted. Defiant and willful, the teenage princess modelled herself on her famous godmother, Queen Elizabeth I. She clearly had aspirations, and her wedding to Frederick V, Elector-Palatine of the Holy Roman Empire, was a lavish event, even by royal standards. In 1619, the couple left their home in Heidelberg for Prague after Frederick was elected King of Bohemia. But rebellion erupted and they were deposed after barely a year, earning Elizabeth the sobriquet the “Winter Queen”. Exiled to The Hague and amid the bloody Thirty Years War, Elizabeth and her beloved Frederick fought frantic military and diplomatic campaigns to regain their confiscated lands. But Frederick’s life was cut short. He died from fever in 1632. Elizabeth was heartbroken but remained resolute. From behind her desk, she continued to politic hard, determined to recover lost lands and wealth for the sake of her children. Her letters, often in cipher, often witty, and always sealed with black wax, criss-crossed Europe as she forged political alliances and waged diplomatic war. Despite financial hardship, Elizabeth’s royal court evolved into a hub for Dutch cultural life, providing refuge for exiled British royalists, brokering marriages among European aristocracy, and becoming a salon for the creative arts. Elizabeth herself became a figurehead to thousands of Scottish soldiers serving in the Dutch Republic. Elizabeth Stuart died in 1662, and was interred in Westminster Abbey in London. Half a century later, Elizabeth’s long fight finally bore fruit: her grandson acceded to the British throne as King George I.